Nahoon.com reserves the right to, at its sole discretion, to revoke site usage at any time, for any reason and without any notice for any user. Nahoon.com can not be held liable to any transaction on its site. If you do not agree to all of the following terms or conditions, or future modifications, contained in this agreement then do not use the service. As a buyer, when ordering from sellers on Nahoon.com, you are entering in contract to pay and buy the items. You also agree with sellers store policies, found in each store. As a seller to agree to send items and described and in accordance with your store policies. All users agree to pay 4% for sales of items. All users agree to only use PayPal as form of payment. A) Each user takes the responsibility of all text, postings, messages, images, photos, links, or other material (referred hereafter as “Content”) provided on the Nahoon.com. Nahoon.com operates as hands-off, so each use is responsible for content provided. Provide Content that is accurate, truthful, and not misleading in conjunction with using any part of the Nahoon.com. Obey all laws, statutes, ordinances, and regulations in conjunction with using any part of the Nahoon.com. List any single item or multiple items of the same type once. Use the Nahoon.com to contact a user for the sole purpose and intent of buying or selling an item made available for sale by the users on Nahoon.com and explicitly not for solicitation of other services or goods by you or another party. Sell counterfeit or stolen items or anything which you do not have the legal right to sell. Provide Content which may be considered derogatory, hateful, defamatory, libelous, threatening, harassing, pornographic (including all adult/mature related material) or obscene. Provide Content which contains spam, pyramid schemes, advertisements of any kind, referral codes, or solicitations of services or goods not immediately available or which require a deposit for preorder. Provide Content which contains harmful computer code such as viruses, Trojan horses, or worms. Impersonate another person or misrepresent your affiliation with a third party, be it a person, business or otherwise. Use robots, crawlers or other automated means of collecting data without express written permission. Perform any action which uses or may use at our sole discretion an unreasonable amount of Nahoon.com's system resources or cause a slowdown of the service for other users. Any item that which in whole or in part is subject to a recall. Any item or service that violates applicable local, state, federal, or international law in regard to manufacturing, distributing, advertising, or transporting said item. Illegal, counterfeit or contraband items of any sort. Items, materials or products that are copyrighted, trademarked or patented by another party. Replica items, including designer items. Items or products that carry or transmit hidden code or signals with the intention of causing harm or tracking personal or transactional information of any sort. Harmful, harassing, intimidating or defamatory materials, products or items. Hazardous materials, products, or items. Prostitution or other similar services. Any product or service that Nahoon.com determines to be inappropriate, harmful, fraudulent, or illegal. Mature items intended for adults due to language or imagery that falls outside of the traditional acceptable standards for broadcast television that are not properly identified as "mature" in the listing process. E) Any violation of the above guidelines may lead to item removal and/or account suspension. F) All images, descriptions, comments, feedback, reviews and any other material posted on Nahoon.com becomes public property and any Users give permission to Nahoon.com to use that data in any way at its own discretion, including but limited to submitting products to Google and other shopping site, making reviews and comments available for search engines to scroll, using any submitted material in advertisements and promotions, among other things. A) No users should use Nahoon.com to spam any users or spam site with over listing. Any such use is strictly prohibited. B) Nahoon.com reserves the right to terminate ant users accounts at its own discretion for any reason. If any Users find products that should be listed on site, please send e-mail to info@nahoon.com and we will review you request. Please as much details as possible, including your Full Name, Company Name, Address, Phone Number and E-Mail. THE NAHOON.COM SITE AND SERVICE IS PROVIDED “AS IS” WITHOUT WARRANTY OF ANY KIND, EXPRESS OR IMPLIED, INCLUDING, BUT NOT LIMITED TO, THE IMPLIED WARRANTIES OF FITNESS FOR A PARTICULAR PURPOSE, AND NON-INFRINGEMENT. Some states do not allow the disclaimer of implied warranties, so the foregoing disclaimer may not apply to you. This warranty gives you specific legal rights and you may also have other legal rights that vary from state to state. ALL USERS USE NAHOON.COM AT THERE OWN RISK. IN NO EVENT SHALL NAHOON.COM, IT'S OFFICERS, AGENTS, EMPLOYEES AND SUCCESSORS BE LIABLE TO YOU OR ANY THIRD PARTY FOR ANY DIRECT OR INDIRECT, SPECIAL, INCIDENTAL, OR CONSEQUENTIAL DAMAGES IN CONNECTION WITH OR ARISING FROM ERRORS, OMISSIONS, DELAYS OR OTHER CAUSE OF ACTION THAT MAY BE ATTRIBUTED TO YOUR USE OF THE SERVICE, INFORMATION, ADVICE OR PRODUCTS RECEIVED THROUGH OR ADVERTISED IN CONNECTION WITH THE SERVICE OR NAHOON.COM SITE. Some states do not allow the disclaimer of limitation of liability, so the foregoing disclaimer may not apply to you. ALL USERS USE NAHOON.COM AT THERE OWN RISK. Nahoon.com is designed for reasonable Users to be used in reasonable fashion. If you do not agree with Nahoon.com terms, Please Leave Now. 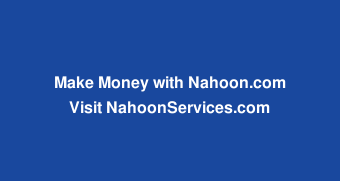 Nahoon.com is looking only for Reasonable and Honest Users. You agree to indemnify and hold Nahoon.com, its officers, agents, employees, and successors harmless from any loss, liability, claim or demand, including reasonable attorneys' fees, made by any third party due to or arising out of your use of the Service, violation of this Agreement or any breach of your representations and warranties set forth above. There will be changes made to Terms and Conditions and all users agree to abide by them. Changes will be made without notice and will be made available online. Nahoon.com also reserves the right to disallow, remove or move Content for any infraction of the above conditions or for any reason whatsoever.